I don't know if it's the promise of spring around the corner or my impending due date causing a nesting instinct, but I've felt an overwhelming desire to organize lately. 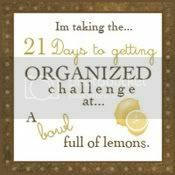 Not too long ago I stumbled upon a 21 day organizing challenge at A Bowl Full of Lemons. The challenge has ended, but that's no reason for me not to do it! I'll try to post some before and after pictures as I go. I know I'll need to tweak her list a bit since one BIG area for me is the kids room. Somehow I need to make wardrobes and baby equipment for 2 kids fit into the smallest room of our house. Yikes! What about you? Do you do any annual spring cleaning or organizing? Do you have a method or just do what you feel? I'd love to hear about it!